The shrill blast of the stationmaster’s whistle makes me jump. Mothers and daughters cling to each other. Wives clutch their children to their chests as they bravely wave their daddy good-bye. Great clouds of smoke billow around us and I cover my mouth with my handkerchief as the pistons yawn into life and begin turning on their cranks. The carriages jolt to attention, and he is going. The author's prose is refined and subdued, yet perfectly reflects the era in the vocabulary and the dialogues; the period details are stunning in their accuracy and vividness, as if captured by a a photograph. The author displays such an astonishing knowledge of the artistic world at that time, whether it concerns the movies, the music, or the celebrities. The writing really carries the reader through out the story and makes you feel as if you are part of the 20's for at least a little while. There are also plenty of interesting secondary characters who in their own way influence the course of the story. I loved Dolly's side kick at the Savoy. She had personality and was always up for fun and games. All the scenes with the two of them together were splendid. There are three different perspectives in the book. Loretta the dancer, Dolly the dreamer and Teddy the boy Dolly was to marry. Each gives a totally different picture of the times they are living in from their points of view. Loretta struggles with her stage presence and the secret the hides. Dolly dreams of being on stage one day and not having to clean other people's room anymore. Teddy, I will leave to the author to describe to you. His story is a special one and any information might give away too much. Let me just say, this book is a rare and special one. 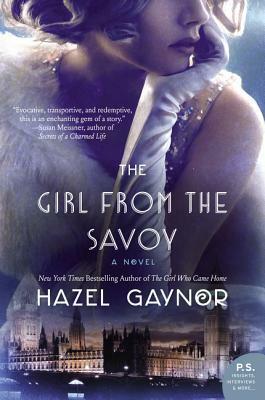 Miss Gaynor is quickly becoming one of my favorite historical fiction writers.